Two recent news items confirm, with regrettable accuracy, the revelations appropriately disclosed by Cuba regarding plans by the current U.S. administration to obstruct justice in its desire to please the Cuban-American mafia that controls the destiny of southern Florida and to whom it owes, among other expensive favors, the fraudulent assumption of power by George W. Bush in 2000. On Wednesday October 26, in an embarrassing and shameful and act, which the Miami media merely characterized as news, representatives of the Department of Homeland Security permitted the expiration of the time allotted to appeal the ruling issued one month earlier by immigration Judge William L. Abbott, in the ridiculous immigration trial that they feigned to be proceeding with for terrorist Luis Posada Carriles, and that ended by not even being that, given that they never investigated the means and methods used by the mafia to get the criminal into the United States. The double standard of U.S. authorities in dealing with terrorism had never been revealed with such audacity. By not appealing the ridiculous ruling, the officials of the DHS — a superstructure with a multimillion-dollar budget, whose agencies are supposedly charged with protecting U.S. citizens from acts of terrorism — gave their blessing to the farce in El Paso and have just expedited the definitive accommodation on U.S. territory of someone considered, along with Orlando Bosch, to be one of the two jost dangerous terrorists in our hemisphere. "We are very satisfied, although honestly we did not expect that there would be any appeal…" admitted lawyer Eduardo Soto, in statements to El Nuevo Herald, the same libelous newspaper that served as a mouthpiece for the brazen revelations by Posada’s lawyer himself on the open blackmail that he negotiated in Miami, while the hearing farce was being mounted in El Paso, in which, for many people, he was inexplicably absent. Another DHS structure now comes into play. Dean Boyd, spokesman for Immigration and Customs Enforcement (ICE), said that the immigration judge "ordered Posada to be deported from the United States, and our intention is to comply with that order." This was also published in the Herald, which, at the same time, rushed to specify that a third country must be found, because "Posada’s deportation to Cuba and to Venezuela will not occur in line with the International Convention Against Torture;" that is to say, the vulgar lie to which the aforementioned Abbott lent himself by accepting to put together a ruling that served the ferocious campaign of defamation against the Venezuelan government and opened the way to sheltering a self-confessed terrorist and fugitive of justice. One has only to review the history of how Bosch took refuge in Miami to conclude that a third country willing to accept Posada will never appear, and the end result this time, like before, will be another "presidential pardon" from a member of the Bush dynasty — this time the son, as it was last time the father — with intermediary services by the mafia’s representatives in the House of Representatives, if they are so needed, when the deep ties involving the president’s family in Posada’s criminal history are already known. For now, the attorney Soto, with the audacity that he is granted by this negotiated impunity, has announced that "the 90 days after the decision having been completed," he will begin the paperwork to set his client free. Meanwhile, the government is hiding behind another scandalous silence regarding the demand for extradition, argued for in great detail by Venezuela, with all the proof it has available on the terrorist’s responsibility in planning in Caracas the sabotage of the Cubana airliner that cost the lives of 73 people in October of 1976, an accusation supported by numerous CIA and FBI documents declassified in recent years. 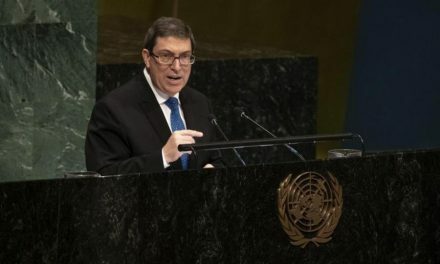 Cuba, with the moral authority granted to it in its condition as the main victim of that crime but which, nevertheless, has renounced its legitimate right to judge the murderer in favor of a country with more flexible laws and extradition treaties with the United States, once again urges that Venezuela’s demand is considered, and an end to the farce that, between tricks and silence, has been orchestrated by the U.S. government to cede to the mafia’s blackmail in the interest of having their terrorist as a protégé in a nation that is currently sacrificing its young people on the altar of a false war against terrorism. That’s enough of the lies and cover-ups. Those who ordered the notorious decision in El Paso are the same ones who are not appealing it. In short, they are all officials of the same administration, and it is known that they all carry out direct orders from Washington. That was confirmed when Posada’s lawyers announced that the terrorist would renounce his asylum petition to prevent his statements from affecting the government, with which he was negotiating another way out. What was that? Refuge for the terrorist, this new slap in the face for those of us who suffer for the victims of the Barbados crime, but also for the mothers of the more than 2,000 U.S. dead killed so far in the senseless, lying war against terrorism, which W. Bush’s government insists on maintaining. The second item of news that confirms Cuba’s appropriate revelations was published in the Miami media this past Monday, October 31. That day, the 11th Circuit Court of Appeals in Atlanta agreed to consider the appeal by the U.S. Attorney against the unanimous decision by a panel of judges from that same court on August 9, 2005, who overturned all of the convictions of the Five and ordered a new trial. This agreement, which was a decision of the majority and not a plenum of the Circuit Court, is conducive to a prolongation of the process, hindering the possibility of justice being done immediately and the five anti-terrorist fighters being brought back to their homeland. Prolonging and hindering the implementation of justice is precisely what the U.S. Attorney was seeking by appealing the August 9 ruling, considered by experts to be irrefutable proof that the Five were victims of an arbitrary legal process, undermined by the prejudices of a community that for more than 45 years has been living under the pressure of hatred towards everything related to Cuba and the Revolution, a hatred particularly exacerbated by the local media during the trial. And that unanimous decision by three judges in Atlanta ordering a new trial already had another forceful precedent in the resolution issued the previous May 27 by the UN Human Rights Commission’s Working Group on Arbitrary Detention, which declared illegal and improper the arrest and entire subsequent procedure against the Five. While the October 31 accord was one option, in the opinion of experts on the case, the unanimity of the August 9 ruling by the three-judge panel and the weight of its 93 pages of solid arguments made it possible to expect that the just order for a new trial would be ratified. But the prosecution’s appeal was equally expected, given that for them, reopening the process would signify something like opening a Nuremberg trial against the historical anti-Cuban terrorism generated from Miami, now in the conditions of a case that could no longer be silenced as in previous times. Let us not forget that the mafia’s representatives, Ileana Ros-Lehtinen and Lincoln Díaz-Balart, were unsparing in their accusations against and insults to the three Atlanta judges, and that Miami’s jost aggressive media even described that U.S. justice system agency as "pro-Castro," reacting to the August 9 ruling with the jost vulgar expressions of the visceral hatred that disqualifies them from being just in anything related to Cuba. Without doubt, for that reason the news that the appeal has been accepted was announced first and to date only in the poisoned lair of the press tainted by the anti-Cuban hatred fostered by the rabid ultra-right in Miami. Meanwhile, silence has once again descended over the case among the big business press of the United States, which had reflected the previous decision by the three judges and which should have been even more interested in the issue now, when aljost a dozen Nobel Prize winners and more than 6,000 important individuals from around the world have personally addressed themselves, in an Open Letter, to the U.S. Attorney General, demanding the immediate release of the Five. "? As is known via the document read out a few months ago in the Anti-Imperialist Tribunal and signed by one of the greatest writers in the history of this hemisphere, Gabriel García Márquez, in which document he detailed the steps Cuba had taken in to elicit a response from the U.S. authorities when we informed them that that terrorist group, centered around Posada Carriles, was plotting to blow up aircraft in flight aboard which U.S. citizens were also traveling. After that wave of attacks on hotels in Cuba, which was discovered and paralyzed, a difficult situation was created for the terrorists and they were already thinking of sabotaging regular airlines flying to Cuba using the same procedure: to board mercenaries in the plane, to plant devices that could explode 50, 60 or even 90 hours later when they had already left the country. We communicated this to the U.S. government, offering them information, precisely sharing what those comrades now in prison obtained when they were seeking information on those terrorists in order to defend our people. Of course, they were not the only ones, but were part of the mechanisms via which the country could be alerted to and could thus prevent such acts. You will recall what happened. They even sent in the FBI to see, confirm; they were given all the elements of the case and, a few days later, what they did was to follow the lead — maybe they already had some — arrest those comrades and subject them to the atrocious procedure to which they were subjected. They were alone, they couldn’t even talk to each other, in different places. There are close relatives who have been unable to visit them. Those shameless individuals who tear their hair out against the Revolution which, with total justice, is combating the mercenaries who support terrorism, who support the blockade, who support the cowardly actions against our country are not saying anything about those who are imprisoned there. They will not be left with the jost minimal moral — currently at the height of the soles of their shoes — as it has always been throughout history, since their existence as industrialized nations, exploiting the peoples, exploiting continents and exploiting the world. But when we related that episode that García Márquez detailed, we waited to see what the chiefs of the empire would say, if it was the truth or lies that we had informed the president of the United States of the matter, if it were the truth or lies. They have not uttered a single word: "I received that report, or I didn’t receive it," "the FBI knew or didn’t know;" "the FBI traveled to Cuba or didn’t travel to Cuba;" "the FBI received this and that information," much of which came from those comrades who are prisoners there. Those comrades were not only defending the people; they were defended the U.S. people, U.S. citizens from the actions of the terrorist Miami mafia and killers from Posada Carriles’ gang. Why, after so many months, has there not been even an elemental response to those questions posed by Fidel, based on an irrefutable historical document? Because the same injustices that are behind the immoral decision of the U.S. administration to give into pressure from the mafia and pave the way to asylum for Posada, while maneuvering to prevent a new trial that would bare to the world the prolonged war of terror that successive administrations of the empire have sponsored in the frustrated attempt to destroy the Cuban Revolution. Silencing the truth is an unpardonable crime, far more so when within it lies the possibility of giving a just punishment to the killers and a merited acknowledgement to the heroes. Cuba will not cease in its demand for a response to its questions to the U.S. government and to all those who know the truth related in that document which, at the same time, confirms how dangerous Luis Posada Carriles and his accomplices still are. Luis Posada Carriles and his accomplices, not only for Cuba but also for U.S. society itself. Those who are silent are granting refuge to terrorists and prison to those fighting against terrorism. And they are responsible for illegal and infinite wars in the name of a lie — every day more evident and unacceptable — which is taking to their deaths thousands of young people from the U.S. and other parts of the world. Now more than ever a commitment to the truth, which is the cause of the just, is indispensable.